Fifteen years ago, I began a journey of unknown destination. Last week, we celebrated that journey -- and the many people who have journeyed with us. Many destinations -- Haiti, Indonesia, Sri Lanka, India, Cuba - have become apparent over the years, as has our focus on the arts, education and orphan care. 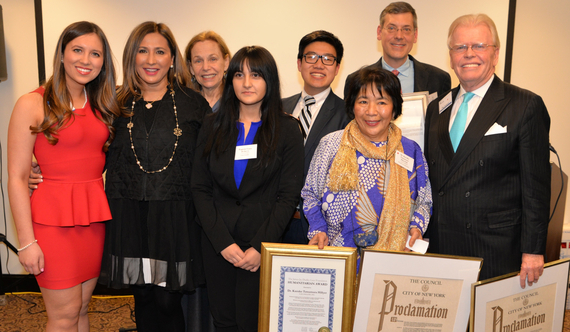 J. Luce Foundation Awardees Alana Galloway, Meera Gandhi, Mitzi Perdue, Eugenie Carys de Silva, Seal-Bin Han, Dr. Kazuko Tatsumura Hillyer, the author, and Kevin McGovern. Photo: Annie Watt/Stewardship Report. 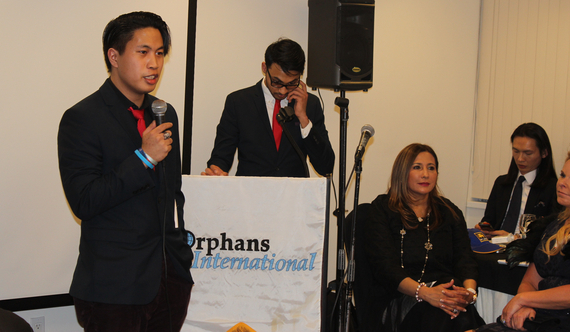 I founded Orphans International Worldwide (OIWW) fifteen years ago with the help of my mother. Then, inspired by my father's legacy, I created The James Jay Dudley Luce Foundation five years ago. 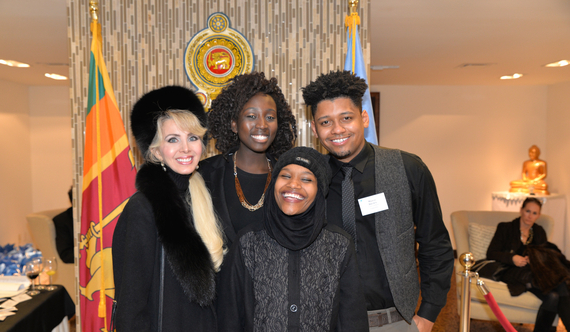 Last week we celebrated these two decades of service at the Permanent Mission of Sri Lanka to the United Nations, honoring the second year of Luce Scholars, the fifth year of Luce Leaders, and the fifteenth year of Humanitarians. 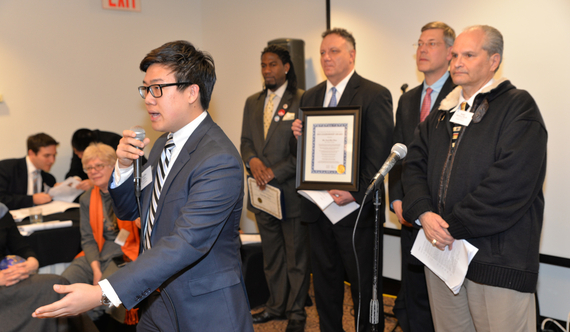 Luce Leader Seal-Bin Han with the Hon. Jumaane Williams, Dr. William Bauer, the author, and Dr. Ralph DePalo. Photo: Annie Watt/Stewardship Report. Our Luce Leaders include Seal-Bin Han, a sophomore at Johns Hopkins University studying electrical and computer engineering as a Bloomberg Scholar; Jamil Patacon Fuller, a freshman on scholarship to Lawrence University; Alana Morgan Galloway, a junior at Convent of the Sacred Heart High School in Greenwich; and Eugenie Carys de Silva, who graduated with a Master's degree from Harvard at the age of sixteen. Seal-Bin Han is dedicated to finding a new paradigm for philanthropy, Jamil hopes to use his talents to heal the world, Alana focuses on specific social problems including bullying and teen suicide, human trafficking and prison reform, while Eugenie strives to use education to better humanity. I have written about or with most of the young leaders in this publication. See: A Young Global Leader at Johns Hopkins, Young Global Leader Embraces Prison Reform, and Young Global Leader Nabs Harvard Master's Degree... at 16. Each Luce Leader was given tools for improvement. These included four books, two of which I have reviewed here: Frank Perdue: Tough Man, Tender Chicken (Mitzi Perdue), The Sufi's Garland (Manav Sachdeva Maasoom, our poet laureate), Management: Fearless Leadership in a Social World (Alison Fine), and Dreams of My Mothers: A Story of Love Transcendent (Joel L. A. Peterson). To remain humble and retain a sense of humor, they also received a special Build-a-Bear that the company's founder Maxine Clark had created for each young leader based on their profile. 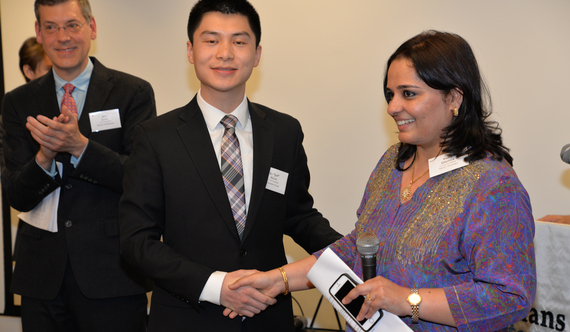 The author applauds as J. Luce Scholar Jeff Guan accepts his award with Vishu Grover of Legacy High School. Photo: Annie Watt/Stewardship Report. Finding work that you believe in is deeply important, and I encourage you to continue along the path that you have found. Human Trafficking - like prison reform, teen suicide, and other troubling issues that you have highlighted - is something that people too often want to sweep under the rug. As you continue with your studies and your career, I hope you continue asking difficult questions, rejecting easy answers, and using your gifts in reporting to bring out the truth. We have begun a scholarship program known as J. Luce Scholars to provide financial awards to undergraduate and graduate students for academic and/or living expenses in the U.S. Our 2014 Awardee was Jamil Patacon Fuller and our 2015 Awardees are Yu "Jeff" Guan and Jeremy Leung. 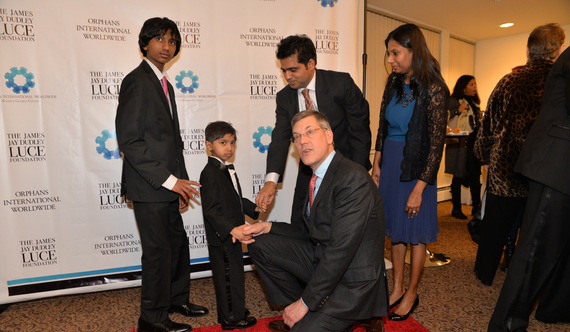 The author with the Herath family - brother Ramin, parents Sunil and Nayana, and four-year old Dylan. Photo: Annie Watt/Stewardship Report. I applaud tonight's Luce Leaders for all that you have done to strengthen our global community and look forward to the ways your outreach will meet the challenges of the future. 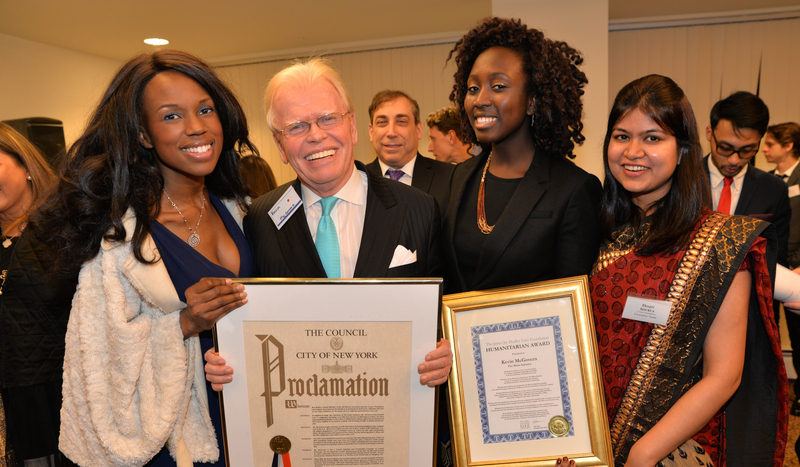 On behalf of the City of New York, congratulations to all of tonight's honorees. One of our foundation's Global Advisers, NYU's Ralph DePalo, Ph.D., also Director of Archcare Senior Life PACE Program and a Scientific Adviser with the Global Stress Initiative, said in his remarks, "The J. Luce foundation is a wonderful venue for young adult global leaders to spark their cognitive curiosity, creativity, and 'caringness' in bettering the human condition." 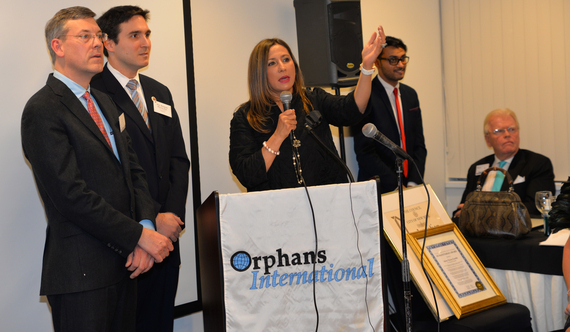 Orphans International Worldwide and our foundation have a long history of acknowledging the efforts of individuals who have dedicated their lives to the betterment of humanity. These Humanitarians are exemplified by those who believe, like this year's Foundation Honoree Mitzi Perdue, "Success is not measured by what you can get, but by what you can give." H.E. Dr. Palitha T.B. 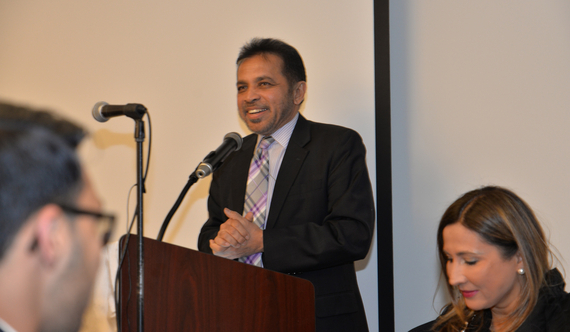 Kohona, Sri Lankan Ambassador to the United Nations, delivering his second keynote address as Humanitarian Meera Gandhi looks on. Photo: Annie Watt/Stewardship Report. Past Awards from OIWW and the Foundation have been presented to H.S.H. Albert II of Monaco, H.E. Amb. Dr. Palitha Kohona (Sri Lanka), H.E. Hon. Li Baodong (China), H.E. Haya Rashed Al Khalifa (Bahrain), Peter Yarrow, and the Hon. Carolyn Maloney. The author with the Honorable Benjamin Kallos, Esq. and Humanitarian Awardee Meera Gandhi. Photo: Annie Watt/Stewardship Report. Kazuko Tatsumura Hillyer was born into a distinguished old family of silk in Kyoto, Japan, Dr. Kazuko's tireless life long work in philanthropy is vast and well known, ranging from Save the Beacon Theater to Save the Boat People. She has been a dedicated Board Member of Orphans International Worldwide for many years. Her dedicated work for Tibetan children remains very strong and she raised funds for the new academic building at Manjushree Orphanage in Tawang, India. 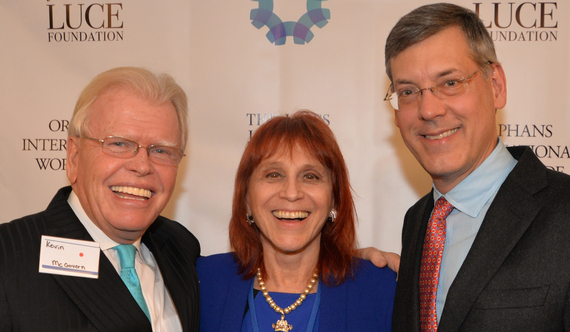 Humanitarian Kevin McGovern, Global Adviser Dr. Judy Kuriansky, and the author. Photo: Annie Watt/Stewardship Report. Kevin, Chairman of The Water Initiative, has founded over 15 companies -- seven of which have become world/category leaders -- has been lead negotiator/principal in over 25 global joint ventures and serves as Chairman of McGovern Capital, an investment, strategy and licensing provider to global businesses. He was a founder of SoBe Beverages, the fastest growing beverage company ever in the U.S. (sold to Pepsi). McGovern Capital was one of three owners of KX Industries, L.P., the largest manufacturer of carbon air and water purification filters, having invented and supplied PUR to P&G, first end-of-tap filter to Brita, and the first refrigerator water filter to Electrolux. 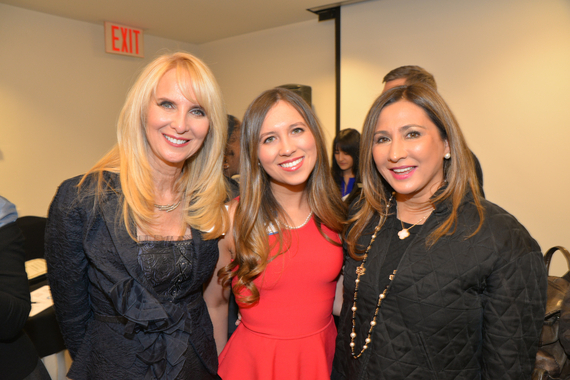 Lynette Dallas and Georgia Sreve with Humanitarian Awardee Mitzi Perdue. Photo: Annie Watt/Stewardship Report. 2016 Humanitarian nominees have also begun to be accepted and include philanthropists Steve Killelea, KarolÃ­na KurkovÃ¡, Chau-Giang Thi Nguyen ("Coco"), and Avis Richards. 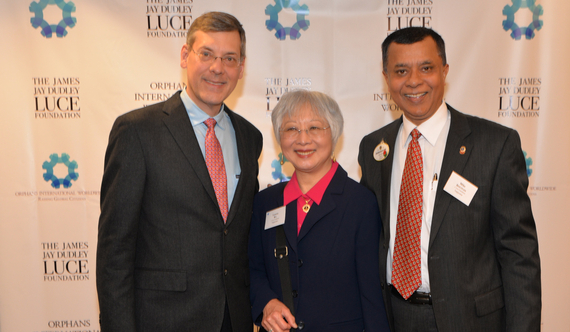 The author with Lions Club International guests Loretta Wu and Mike Bhuiyan. Photo: Annie Watt/Stewardship Report. We were delighted to be joined by our friends the Hon. Benjamin Kallos, Esq. and the Hon. Jumaane Williams, both New York City Council representatives. Ben represents the Upper East Side and my own Roosevelt Island, while Jumaane, who has stood with us year after year, represents Brooklyn where I once lived. The J. Luce Foundation is committed to providing strong role models and mentors to inspire Young Global Leaders who show outstanding leadership skills. With the proper nurturing they will become tomorrow's thought leaders and game changers. This year's veteran leaders and humanitarians included Mitzi Perdue, Kevin McGovern, Meera Gandhi, Rita Cosby, and Dr. Kazuko Hillyer. 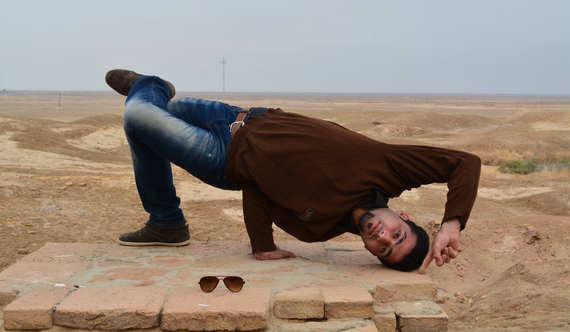 Honorable Mention to Adil Qays Adil, a gifted modern dance student in Baghdad, Iraq. Photo courtesy of the Battery Dance Company. In addition, each year we name an Honorable Mention. J. Luce Foundation Honorable Mention was given in 2014 to Adil Qays Adil, an aspiring dancer, choreographer and filmmaker in Baghdad, Iraq; and in 2013 to Elian GonzÃ¡lez, young global leader in Cuba. Past Honorees include Eric Niragira, an ex-child soldier from Burundi who founded a training center for development of ex-combatants known as CEDAC; Ranjan Kumar, founder and president of the Gyanjyoti Rural Development Welfare Trust in Bihar, India; and Omar Ghraieb, freelance journalist in Palestine and translator for MSF (Doctors without Borders). Jonathan Hollander and Christine Vogel of the Battery Dance Company. Photo: Annie Watt/Stewardship Report. During the reception we acknowledged organizations and leaders we have supported through both microgrants and 'spotlighting.' These included the Battery Dance Company (Jonathan Hollander), the Center for Nonprofit & Public Leadership at U.C. Berkeley, Project on Armed Conflict Resolution and People's Rights (Dr. Angana P. Chatterji), The Child School-Legacy High School (Vishu Grover), The Children's Institute (Benjamin M. Imbrogno Memorial Fund), the Chinese-American Planning Council (Youth Empowerment), Fountain House (Camille Tibaldeo), Indo-American Arts Council (Aroon Shivdasani), Marietta College (Dr. William Bauer), and The Osborne Association (Elizabeth Gaynes, Esq.). Supporters Susan B. Hale, Ekua Musumba, Ri'Aasa Toppin, and Marvin Brown. Photo: Annie Watt/Stewardship Report. Last year we aired a video interview with me in my living room explaining the origins of our two organizations. However, no one person can affect social change - it can only be achieved collectively. Our latest video that premiered in last week's leadership reception, narrated by our great and talented friend Rita Cosby, is entitled The Many Faces of OIWW and the Foundation (here). The video shows that there are dozens -- if not hundreds -- of people around the world helping us better humanity. The reception gathered and celebrated this team. Joey Vaughan was media producer, Josh Stauffer and Jeff Guan coordinating producers. Michelle Travis, Kevin McGovern, Ekua Musumba, and Deepti Shukla. Photo: Annie Watt/Stewardship Report. 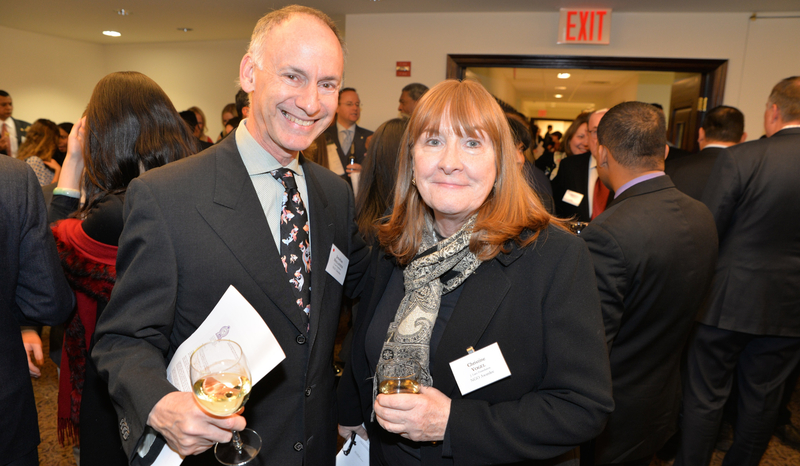 Our guests at the reception included Barry Klarberg of Monarch Wealth & Business Management. Tomaczek Bednarek made an impassioned and much-appreciated impromptu appeal for support of our mission. Our Executive Committee, known as the 'Exec Team,' is a task-oriented global group that has met once a week in New York City art galleries, including Asymmetrik Gallery and Gallery RIVAA, since 2011. Senior Members include Ashwani Agrawal (India), Abhinav Chintakunta (India), Meera Kajendrakumar (Sri Lanka), Mathew Luce (Indonesia), Ekua Musumba (Kenya), Deepti Shukla (India), April Lauer Stone (U.S.), and Joey Vaughan (U.S.). Yu "Jeff" Guan (China) serves as Senior Team Leader. Junior Members include Thanh "Ethan" Dang (Vietnam) and Haseeb Hassan (Pakistan/U.K.). The group is led by Team Director Jeremy Hu (Taiwan). An awesome display by the National Women's Dance Troupe of Sri Lanka. Photo: Annie Watt/Stewardship Report. >Of course, no reception is tolerable without entertainment. Ours was eclectic! Eranga and Prianga Pieris, the "Donny and Marie of Sri Lanka," sang a calypso melody featuring the songs of my favorite Harry Belafonte that left me swaying in my seat. The National Women's Dance Troupe of Sri Lanka performed flawlessly under the direction of Dhammika Navinna with choreographer and percussionist Dilhan Pinnagoda and percussionist Nalinda Pieris. Their presence had been arranged by Aroon Shivdasani and the Indo-American Arts Council (IAAC), representing South Asian culture in North America. 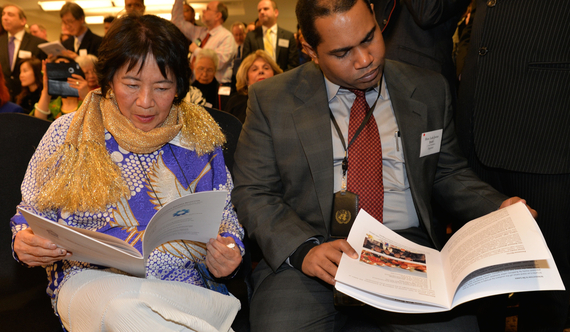 OIWW Board member Dr. Kazuko Tatsumura Hillyer and the Hon. Luis Javier BarÃ³ of Cuba. Photo: Annie Watt/Stewardship Report. A duo of Chinese musicians, Feifei Yang and Jiaju Shen, brilliantly brought China's traditional music to us through their modern interpretations of classical pieces integrated with modern music. We welcomed Permanent Representatives and diplomats to the United Nations and esteemed Consul Generals from around the world including H.E. Dr. Palitha Kohona of Sri Lanka, H.E. Luis Javier BarÃ³ of Cuba, H.E. Nguyen Phuong Nga of Vietnam, and H.E. Mary Morgan of Panama. 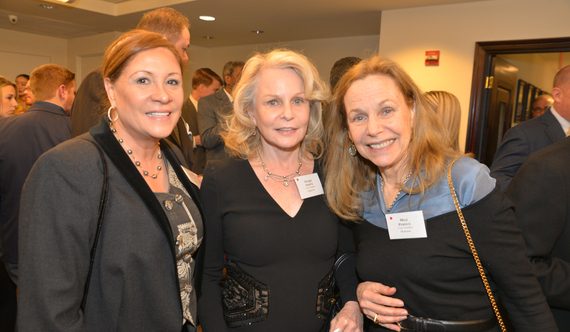 Many of the Foundation's Global Advisers participated in the reception including Cynthia Artin, Evens Anozine, Jaya Dargan, Susie de Rafelo, Dr. Danielle Duret, Sunil Herath, Jitin Hingorani, Jan Anders Ivarsson, Jill Pollans, Lorraine Cancro Silvetz, and Vlada von Shats. I am familiar with and very proud of the achievements of the founder of Orphans International Worldwide and the J. Luce Foundation. My good friend, Bill Bauer has been appointed to serve on the Board of Directors of the J. Luce Foundation, I'm sure he will be a valuable addition to your group. The official photographer for the evening was the talented Annie Watt and her images may be seen here. Orphans International and the Foundation have raised $1.52 million over the last fifteen years, including having received generous proceeds from five estates. Children have graduated from OIWW homes and gone on to university. Young global Luce Leaders have gone on to Harvard, Yale, and N.Y.U. The Foundation has funded numerous organizations in the U.S. and abroad, often year after year. The Foundation's Stewardship Report has highlighted over 1,500 organizations and individuals uplifting humanity. Through all of this, we continue to hold our administrative costs below 10%, creating an astonishing return on investment. My adopted son Mathew James Luce introduced me for the third year in a row. Photo: Ashwani Agrawal/Stewardship Report. I count on our Board, Global Advisers, National Coordinators, Luce Leaders and Scholars - and you - for your continued support over the next two decades towards young global leadership in the arts, education and orphan care. You are the many faces of Orphans International and the J. Luce Foundation - and together we can change the world.